One of the goals of the Florilegium Program is to encourage contemporary artists to illustrate plants of the Sonoran Desert in order to draw attention to its unique flora and inspire efforts to conserve it. The Program hopes that artists will look beyond the more familiar plants and find equally fascinating but lesser-known specimens to illustrate. One artist who has done exactly that is Carolyn Hitchcock. She has worked diligently in Margaret Pope’s “Drawing Plants for a Florilegium” class since its inception. One of the lesser known plants that Carolyn chose to illustrate is Graptopetalum rusbyi, or Rusby’s stonecrop. This tiny plant was first described in 1883 by E.L. Green as Cotyledon rusbyi, giving credit to Dr. H. H. Rusby who had collected the plant near Clifton, Arizona. Twenty years later N.L. 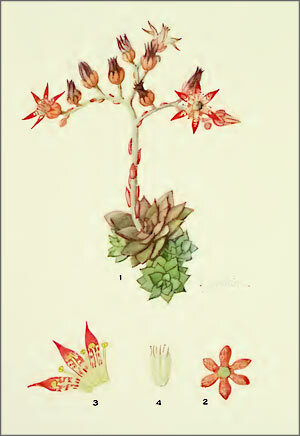 Britton and J.R. Rose placed the plant, with reservations, in the genus Dudleya. In 1920 Edward Bartram found the plant in Sabino Canyon, and, at Rose’s request, sent specimens to the New York Botanical Garden where it flowered in 1923. At this point Rose reclassified the plant as Graptopetalum rusbyi and described it in the journal Addisonia . 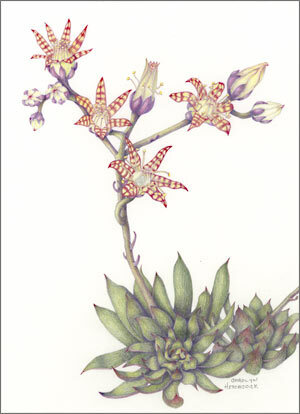 The illustration accompanying Rose’s account was by Mary Emily Eaton, the highly skilled artist whose work greatly enhanced Britton and Rose’s The Cactaceae . This appeared in the August 2013 issue of The Desert Breeze, the monthly newsletter of the Tucson Cactus and Succulent Society.